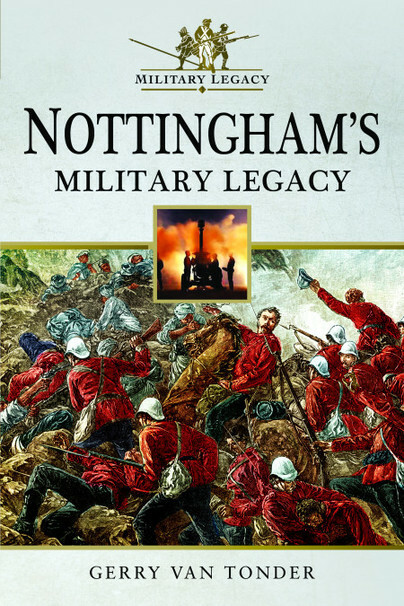 You'll be £6.00 closer to your next £10.00 credit when you purchase Nottingham's Military Legacy. What's this? On 22 August 1642, in his endeavours to quash Parliamentarian insurrection in the Midlands, King Charles raised his standard over Nottingham Castle, a rallying call to all Royalists to support their monarch. Loyalty to the Crown was, however, divided, and before long Parliamentarian forces garrisoned the castle. Late in the eighteenth century, a town troop of Yeomanry was raised in Nottingham, the foundation of the future South Notts Yeomanry. The yeomanry assisted regular troops by helping restore peace during the so-called Bread Riots of 1795, at a time when many of the town’s men had been committed to military duty during the French Revolutionary Wars. Five troops of the town’s yeomanry were again called up for service during the civil unrest of the Luddite Riots of 1811–18. This pattern of service continued over several decades. Evolving into a regiment, the yeomanry were repeatedly deployed against civil dissenters – the Nottingham Riot, and the Reform Bill and Chartist Riots. After seeing combat during the Peninsula Wars in 1815, in the latter half of the 1800s, the 59th (2nd Nottinghamshire) Regiment of Foot formed part of a British invasion force into Afghanistan from India, to curb Russian interventionism in this remote and desolate region. The outbreak of war in distant South Africa in 1899 placed enormous strain on Britain’s military capability. From Nottingham and other county towns, regiments of yeomanry, Hussars and Sherwood Rangers were dispatched to the hostile environment of the African veld. Nottingham’s sons then answered a call to arms in their thousands, only to also perish in their thousands on the Godforsaken soils of France and Flanders during the holocaust that was the Great War. Through the Second World War to the present, Nottingham’s military units underwent successive phases of metamorphosis – from infantry to anti-aircraft and searchlight formations, followed by the relatively recent absorption into a regional entity: the Mercian Regiment. Today, Nottingham’s castle and surrounds bear the symbols of a rich and diverse military legacy – symbols of remembrance, of tribute, and of a tableau of military pride from ancient times. A curious and interesting book for those lovers of naval history of all times and who like stories based on real events. This remarkable account of Nottinghamshire's military heritage may come as no surprise to its citizens, but does to me - I know some parts of the city by virtue of having relatives there, but nothing of its military history, and this fine book is something of a revelation, the nature of which I shall not hesitate to share with those same relatives the next time I see them. Essential reading for enthusiasts and citizens of the county, of course.